Look at the photo below. What you are seeing is the ADA (Americans with Disabilities Act) accessible parking at a branch site for Bank of America (BAC). There are three accessible parking spaces with white signs marking each individual space. Look past the parking spaces and you can see an accessible walkway leading to the door on the left. Look closely and you can see some blue signs along the walkway that read “Accessible Pathway”. This is a rare but excellent signage installation. The photo on the right is representative. The 2010 ADA Standards for Accessible Design, Standard 216, lists the scoped requirements for signage. This Standard does not specifically state that signs are required identifying an accessible pathway. So the decision to install these signs was made by BAC corporation knowing that these signs exceed the minimun guidelines established by the 2010 Standards. The photo below shows the sign, pathway, and accessible entrance to the building. This proactive installation by this corporation is a great example of not only doing it right when it comes to ADA installations, but also an example of a great idea that exceeds the minimums of the 2010 Standards. 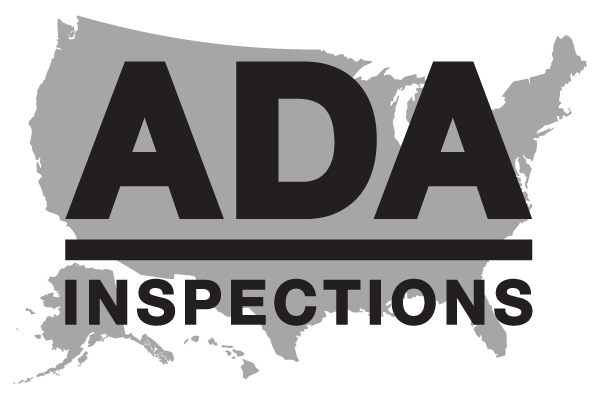 This BAC site would be a great candidate for the Certificate of Excellence offered by ADA Inspections Nationwide, LLC.